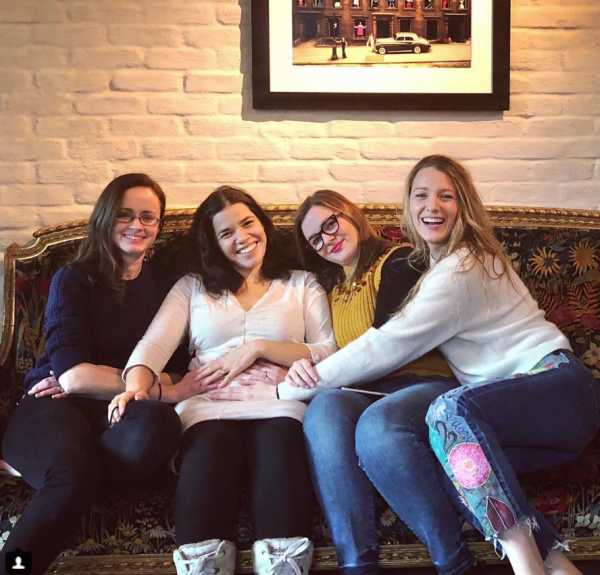 Actresses Alexis Bledel, America Ferrera, Amber Tamblyn, and Blake Lively continued their New Years’ celebration today with a joyous meet-up! I am a big fan of the”The Sisterhood of The Traveling Pants” films. I love seeing the sisterhood in real life. Like everyone else, I’m anxiously awaiting film number 3. Congratulations to America Ferrera, her husband and the baby’s unofficial aunts! All rights to the image and quote belongs to actress America. This entry was posted in Entertainment, Movies, News and tagged Alexis Bledel, Amber Tamblyn, America Ferrera, Blake Lively, the sisterhood of the traveling pants. Bookmark the permalink.